Would you love to have some personalized original artwork on your walls but don’t think your painting skills are up to it? That’s me! 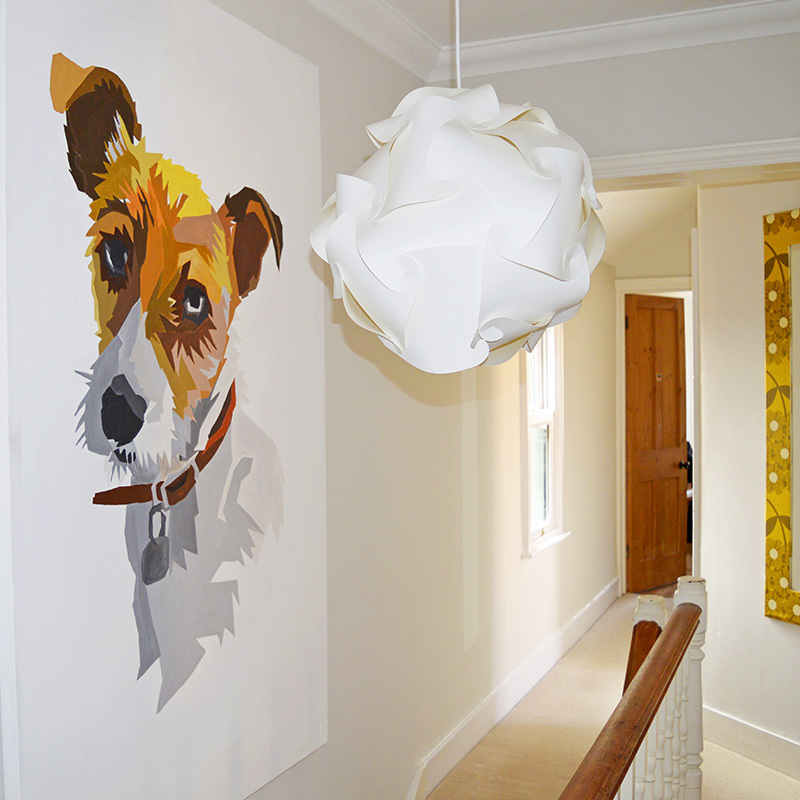 You’d love a portrait of your pet or a loved one but know that when you finished painting, it would probably look nothing like them. 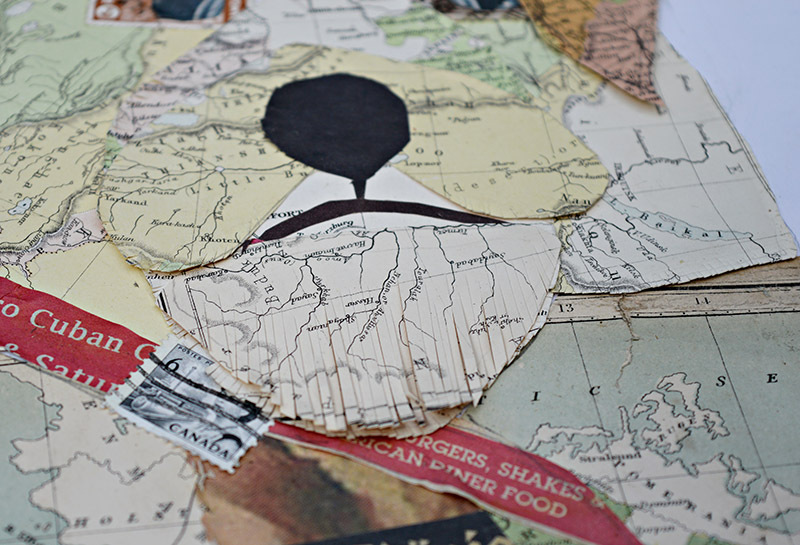 Have you ever thought about making some map art by doing a collage portrait instead using maps? Collages are much more forgiving than a painting. Ok I admit it I have a bit of obsession with map crafts. Not only have I decoupaged furniture and lamps with them, they are now even on my walls. I didn’t just frame an old map and hand it on the wall (that would be too easy) but I have even created some unique map art. 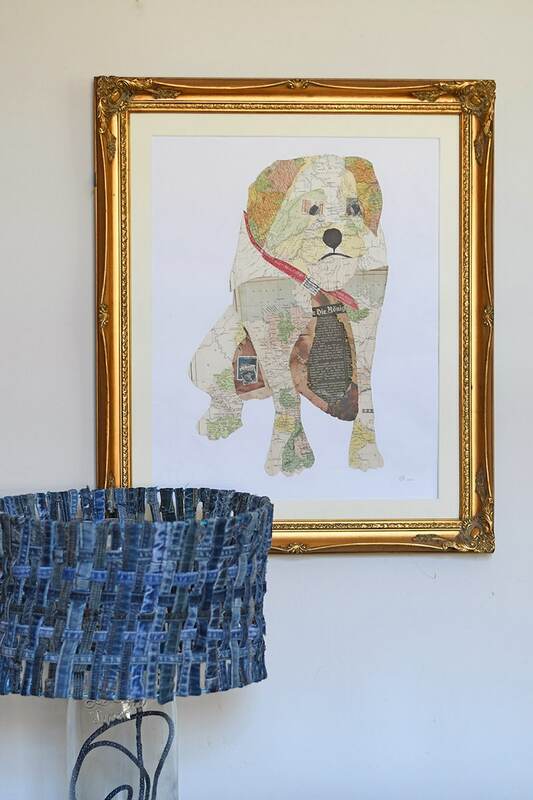 I made a map portrait of our family dog Toby. This map art portrait of our beloved scruffy Foxy Russel is probably one of my most admired pictures on my wall. Well, it’s my favourite anyway! 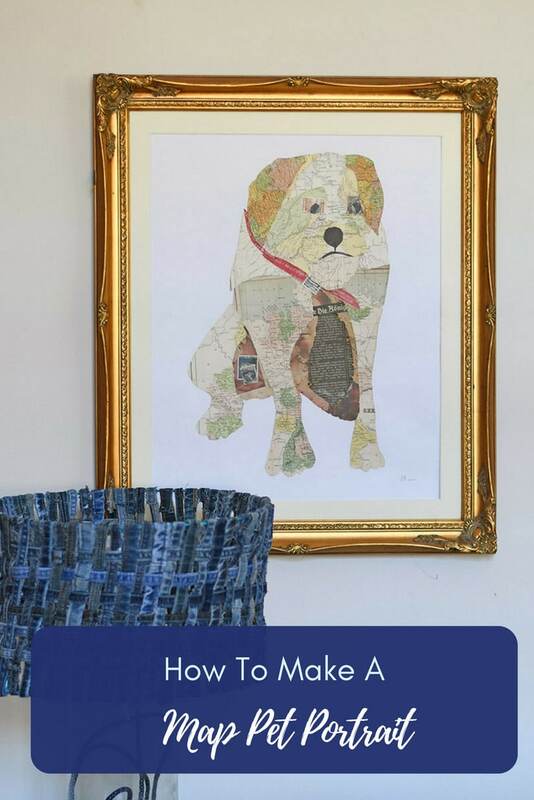 Anyone can make a map portrait, it doesn’t have to be a pet you can create map portraits of people too. However, pets aren’t critical of your artwork so no risk there. I got the inspiration for this artwork after visiting an exhibition of the English collage artist Peter Clark in London a few years ago. My map art maybe not be quite as fabulous as his. 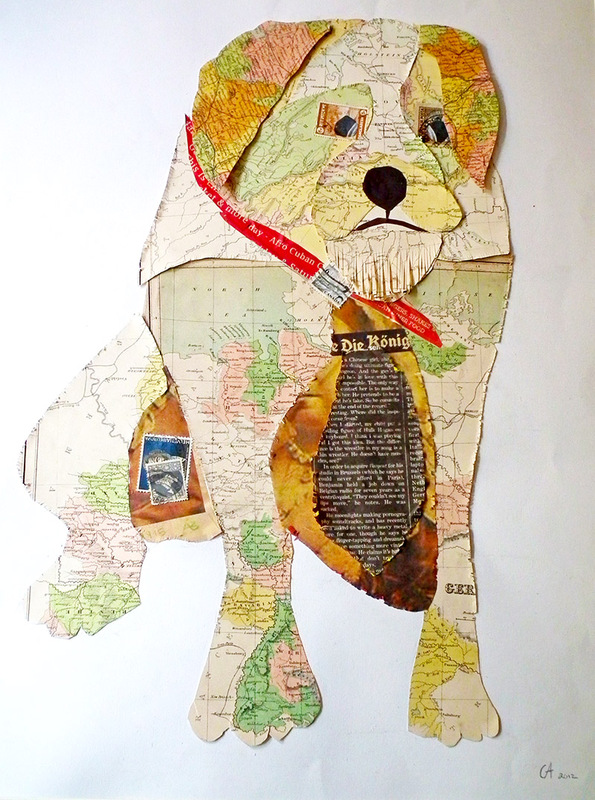 But the map portrait is of my own dog so I have a sentimental attachment to it. Old maps – If you don’t have any to hand you can always download some vintage maps here. Or Cavallini makes gorgeous vintage map gift wrap. Once you have decided on the photo that you are going to base your map art on you will need to make a few adjustments to it. To simplify your photo, digitally posterize it by using a filter in a program like Photoshop. If you don’t have photoshop don’t worry. There are lots of free tools on the internet where you can posterize any picture for free like pinetools.com. Next, enlarge and print your photo the same size you would like your map art. My map portrait was A3 size as I don’t have an A3 printer, I printed my picture of Toby across 2 sheets of A4 paper and taped them together. I could have just sent the A3 file to my local print shop and got them to print it for me or just enlarge it on one of their photocopiers. However, the truth is I couldn’t be bothered to leave the house. 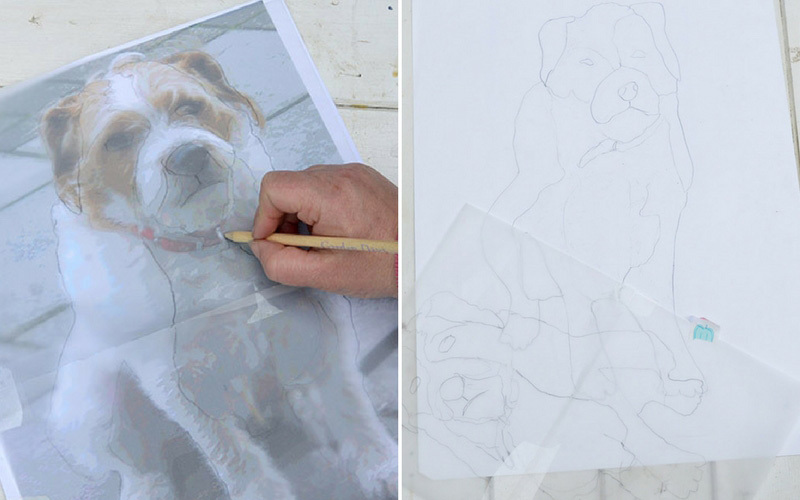 I used tracing paper to transfer my pet photo to my paper. I just traced around the outline of Toby and then each posterized section. 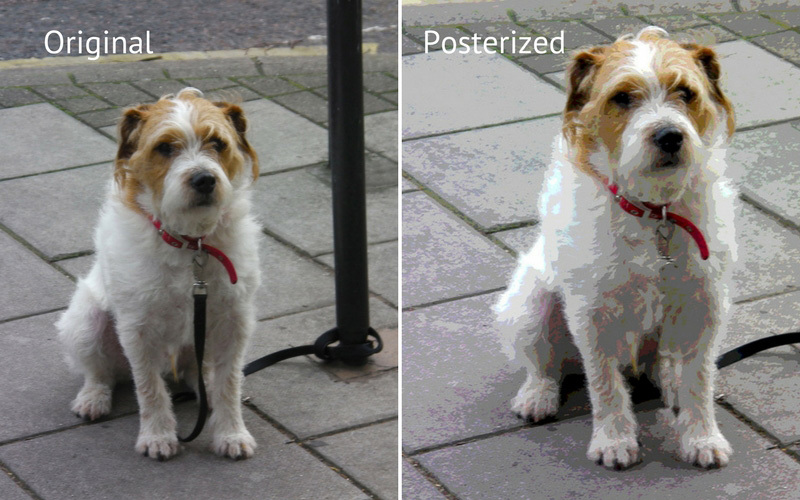 The posterization of the photo helps you pick out the most distinctive sections of your portrait. I kept my outline quite simple with not too much detail. 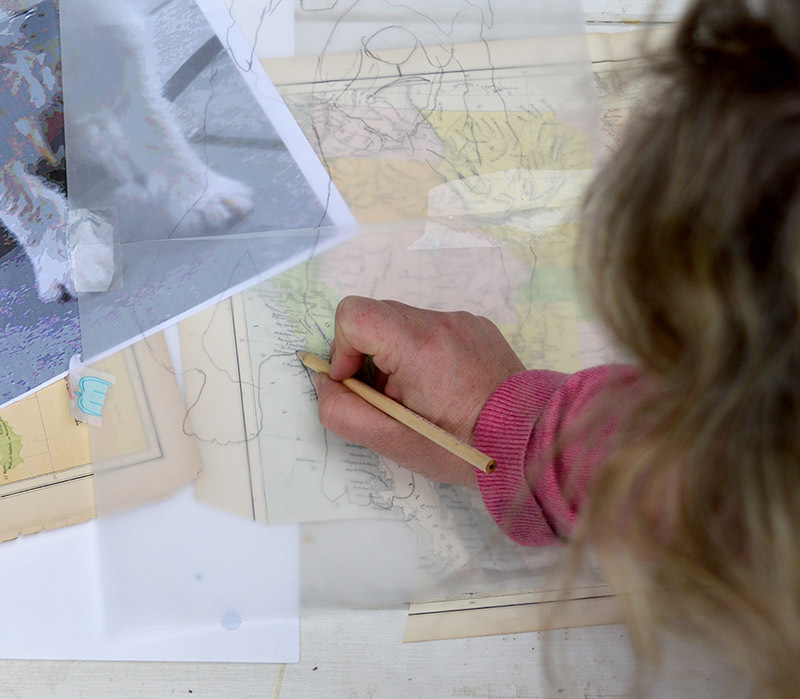 Top tip: When tracing use a soft pencil and go over the back of the traced image with the pencil otherwise you will end up with a mirror image. Picking the right bits of map to use..
To construct the map art portrait you will need to cut out bits of maps to fit into your posterized shape. It’s a bit like constructing a jigsaw. Place your tracing paper over the maps you are using and trace around the shapes. Then cut these out and stick them on your paper outline. When selecting the different bits of the maps to cut up for my map art, I don’t just pick any old bit. I look carefully at my original photo and if it’s a dark bit I then try to look for a dark bit of the map. For example, if you look at Toby’s ears the maps used for this are a slightly different colour than the ones used for his body. 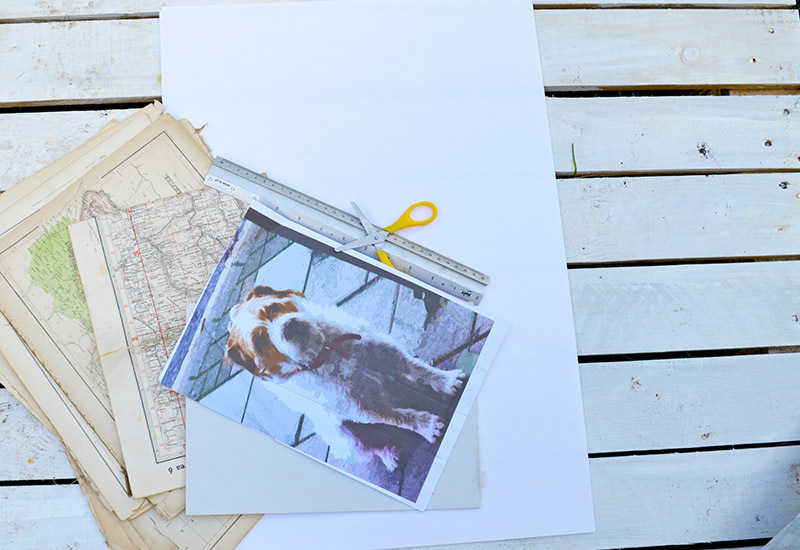 I didn’t only just use maps for this dog portrait. I used some bits of newspaper and stamps. To make the eyes and nose distinctive I cut out black bits from an old newspaper. I used a bit of red paper for the dog collar. It is these little fine details that will bring your map art collage to life. Toby is a scruffy haired Foxy Russell and I wanted to reflect that with this collage. To do this I frayed the edges of my paper before sticking them down. Especially for his beard where I fringed the map with some scissors. Once you get going on your portrait you will actually see how easy it is. 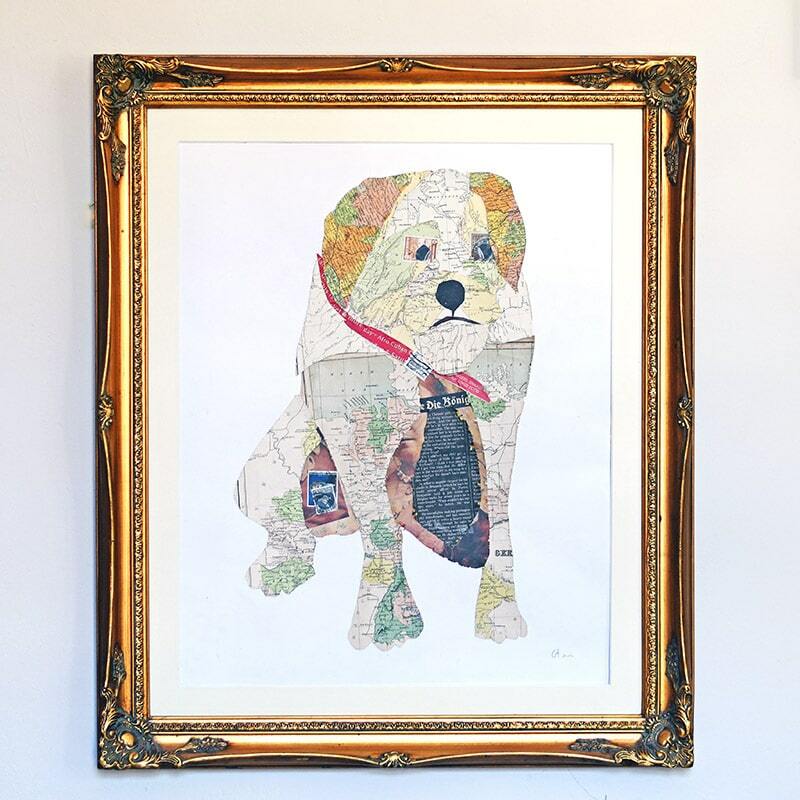 You don’t have to just stick to pets you could try and do a map art portrait of a loved one. Putting a photo through a posterizing filter to simplify it really helps when creating your own artwork. I have used this technique before to actually paint a giant wall art of a dog. 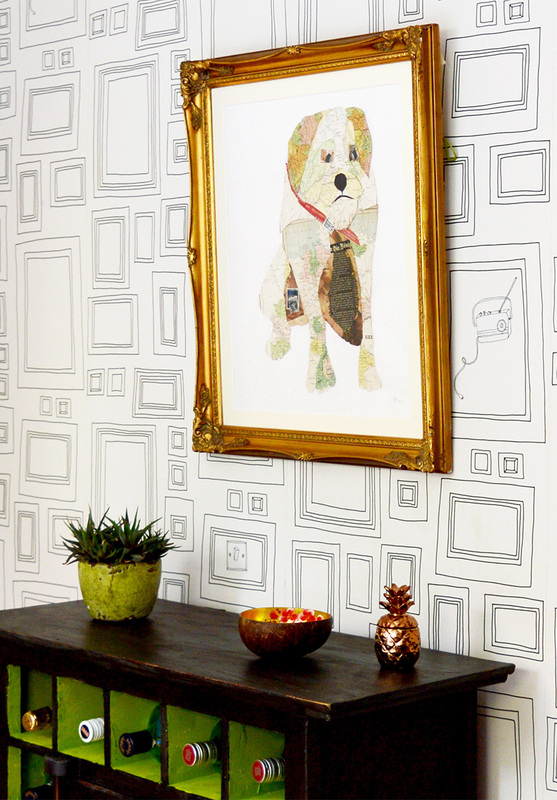 It is really lovely to have personalized artwork on your walls that you have created yourself. It will add interest to your home and become a conversation piece as well as make you smile every time you look at it. If you like making your own wall art you may want to check out my pineapple paper flower wall art or my giant Marimekko Christmas wall art. Thank you for sharing this splendid craft. My art collecting partner has two delightful Cairn terriers, getting on in years, and I cannot think of a gift that would mean more to him! Thank you! I think they would look awesome with a New York map and make a lovely gift. You are brilliant! Love this!!!! Thank you Linda, that is really nice of you to say so. 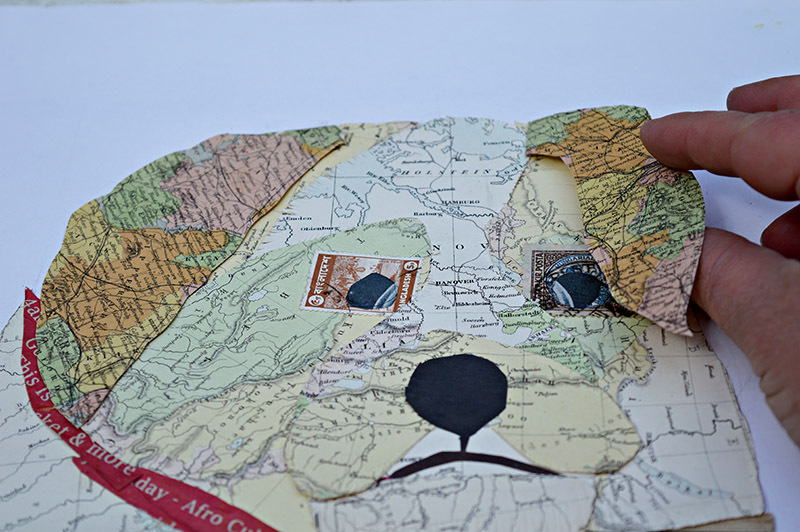 You are the Queen of Map Crafts and this is so darn cute and creative! Thank you for sharing with us at Celebrate Your Story, and I hope you’re having a great weekend. Thank you so much, hope you have a great weekend too! I am do smitten with this project. I plan to make one of our Yorkie. Thank you for sharing your tutorial at the Snickerdoodle Create~Bake~Make link party! I am featuring you today at Snickerdoodle. Thank you so much for the feature. I bet a Yorkie would look great in maps. What an absolutely adorable pet portrait. You made the steps understandable so that any of us can make our own. Congrats, you’re featured this week at the #ThisIsHowWeRoll Link Party. Thank you so much, look forward to seeing the feature. whoa. this looks awesome (and complicated!) and i love it! Thank you, it’s really easy once you start. Thank you Maoist, I just love making stuff especially with maps. Whimsical and unusual but definitely art and (for me) far more interesting than a plain pet photo. Thank you so much and good luck in having a go. Foxy Russell is adorable! I’ve pinned him ~ thanks for sharing your fun creativity at Vintage Charm, Claire! Thank you so much and thanks for the share. This is so clever and creative. I will have to take your word for it for now when you say it is easy to do. It looks fun to try, I’m pinning for now as we don’t have a pet but who knows when I will just NEED to try something like this. Thank you Julie. You could always try and do a portrait of a loved one instead. So clever. Thanks for sharing at To Grandma’s House We Go! Thank you, you should give it ago. It would make a lovely present. I love this! 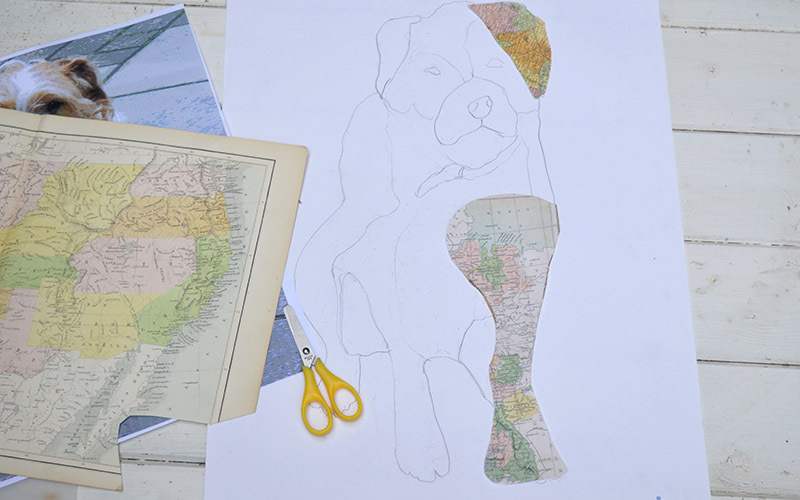 I love maps and dogs, so this is perfect! I’m going to try one with my daughter’s dog. Thanks for the inspiration! Pinned! Thank you, I’m pleased you are going to try it. Good luck with it. What a fun idea – and you’ve made it look so easy! Thanks for sharing on the Pleasures of the NW’s DIY link up! Thank so much. It is easy. I saw your link at Craft Schooling Sunday at Creative Jewish Mom. This is such a great craft – I really like the idea of it being so much more forgiving than if I tried to draw a portrait myself. Thank you so much for visiting. Map portraits as well as forgiving are a fun way to create something personal. Now this is different – I love it! I also think is great that you used maps for this! Thanks Medina, I just love crafting with maps. This is a fabulous project. I will need to try this technique. Thank you, Debra you should give it a go. Oh wow, this is super cute! I just love it. So creative. It’s a real work of art! What a creative piece! I love collage-type art. This reminds me of something I made from different magazine pieces for a project in one of my high school art classes. Thanks for sharing on This is How We Roll link up. Awesome idea! Can’t imagine how long this took to create but the effect is amazing. Visiting from TADA Thursday party. Thank you, Victoria. It didn’t take that long to make it. What a cool project, Claire! I’ve pinned this to try sometime. I have an adorable Bichon #bradleythebichon that I would love to have a Map Portrait of! I’m visiting today from Welcome Home Wednesday and it’s so nice to meet you! Thank you Megin for visiting. I love Bichons they are so cute! This is so cool. 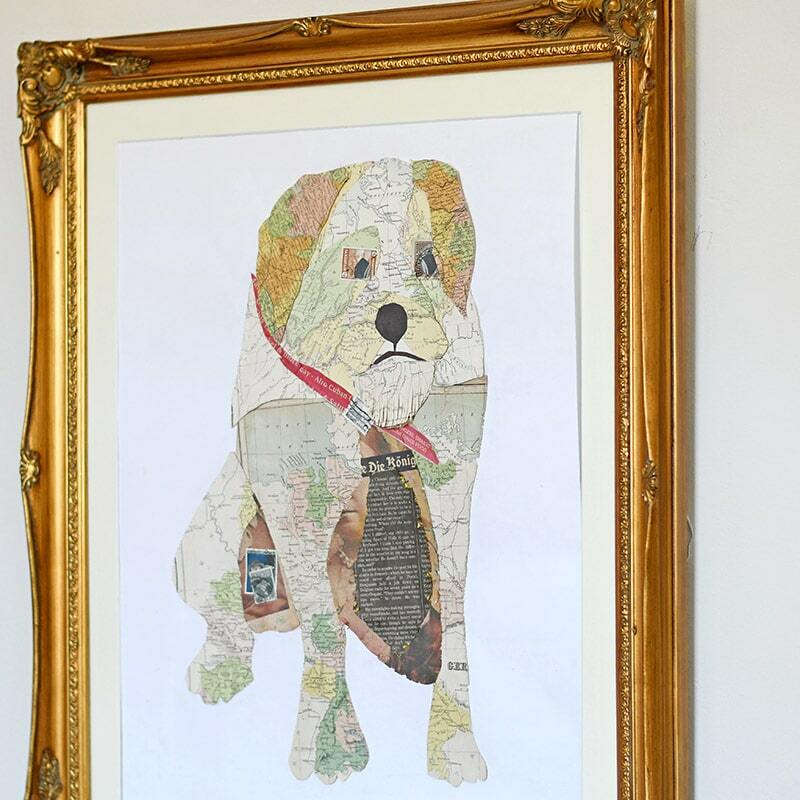 My daughter has a Goldendoodle that she is crazy about and I know that she would adore a map portrait of him to display in her apartment. Thanks so much for such a creative project and a great tutorial. Thank you, and good luck with it. I think a goldendoodle will look fabulous in maps.